BELLINGHAM, WA (December 2007) -- It's a first Christmas for several new members of The Sheehan World family! And Auntie Kathy and Uncle Chuck are extremely happy for all the new parents and grandparents of this veritable Baby Boom. 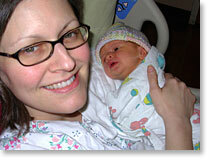 First out of the womb was Paige Cook, the ever precious first daughter of Tom and Kendra Cook. Auntie Kathy got to help Tom change Paige's first poopy diaper at the hospital a few hours after Paige was born. It doesn't get any more exciting than that, I tell ya! Even Grandma Barbara didn't get that joy! 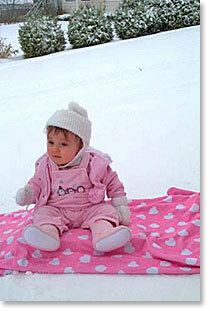 Paige was recently bundled up all in pink to check out the rare snowfall that we get in these parts. 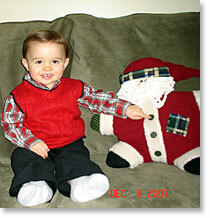 Then in June, Rebecca and John (Jr.) Sheehan welcomed little Michael Everett Sheehan into their home in Massachusetts. Michael is Auntie Kathy’s third great nephew, born on June 5, 2007 at 3:29 a.m. He weighed 7lbs 12oz and was 20 inches long. Despite his small size at birth, Michael is going to be a big boy. 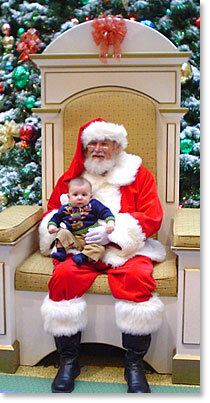 Look how Santa is having to hold him with two hands in the picture at left. Michael is named after Rebecca's grandfather and John's cousin, and his middle name recognizes John’s grandfather, the late, great William Everett Sheehan. Rebecca reports that his personality emerged after just two months around all the Sheehans. He is already playing golf, and he smiles, giggles and makes noises as if he were trying to talk. No telling if he will take after his father and utter only six or seven words a year. 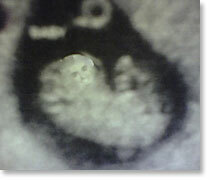 And speaking of Michael -- Michael Mahoney is going to be a DAD in 2008! The godson of the publisher of The Sheehan World and his wife, Dee, are expecting their first child this spring. The Mahoneys aren't saying whether their new baby will be a boy or girl, but The Sheehan World has obtained exclusive pictures of an ultrasound that shows the child will bear a striking resemblance to his Dad. We are ready to declare that the Mahoney baby will be a boy and a spitting image of his Dad. And Trisha will become a grandmother!! Omigod!! Trisha is only one year older than me!! Another first Christmas will be celebrated in Bellingham by Aurora (Rory) Grace Nevaeh Stout, the daughter of Karen and J.B. Stout. Rory arrived at 7:34 p.m., Nov. 11, after more than 32 hours of labor. Yikes! The big girl weighed 8 lbs and was 21 inches long. The name Nevaeh is heaven spelled backwards. Karen and J.B. say that Rory's birth is the dawn of a new chapter in their lives, "granted by the Grace of God and our Angel in Heaven." Amen! Karen and J.B.'s "Angel in Heaven" is their first daughter, Abi, whom they lost in a tragic accident a couple of years ago. Another new baby celebrating a first Christmas is Garrett McGowan, whose mom has a ton of photos online since his birth in April down in Florida. Two other babies who will be celebrating Christmas this year -- but not their first -- are AJ Sheehan and CJ McCarthy, a nephew and great-nephew, respectively, of Auntie Kathy. 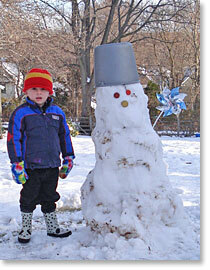 That's Aidan, aka AJ, with the snowman, and Connor John, aka CJ, on the right. The Sheehan World is the world's leading online newspaper for all things important in Kathy Sheehan's world and has been in continuous circulation since 1995. Happy Holidays!